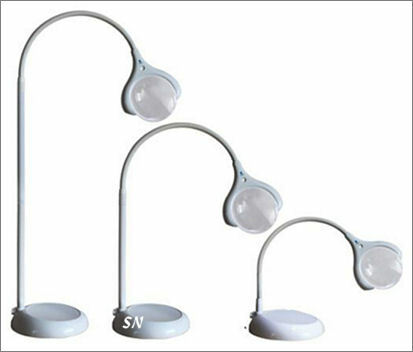 This is a wonderful line of very reasonably priced magnifying lamps! Developed and marketed in England for the past 10 years, these are finally available in the USA! They are nice looking, feature heavy-weighted bases, and strong table clamps. The light is wonderful -- like daylight!!! 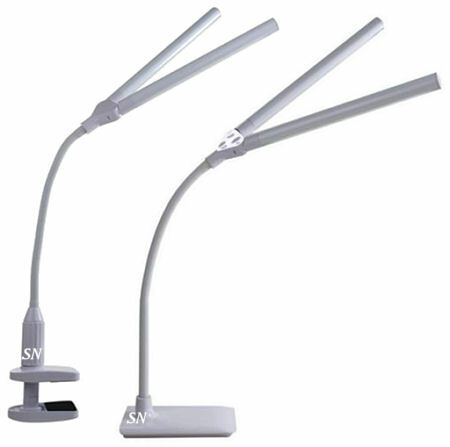 Each lamp features a "gooseneck" type arm that is easy to steer in the direction that's best for you. This is a pretty nice lamp! 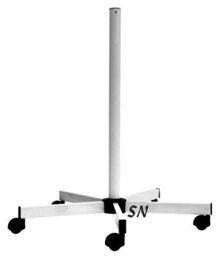 It is designed to work as either a floor lamp (with two different height options), or a table style. It can go from 20 inches high to 50. 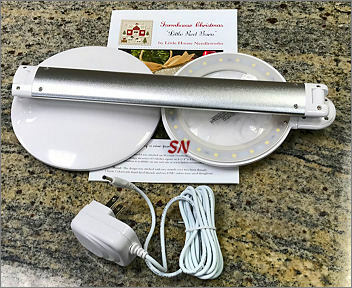 The daylight-balanced LED lights provide accurate color matching - a must for needlework. 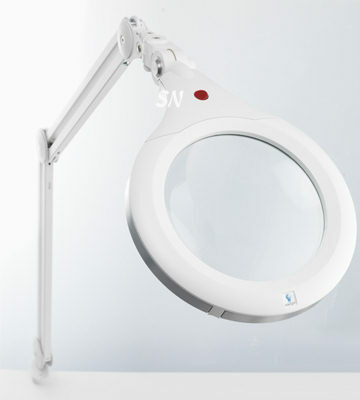 The semi-rimless magnifier lens measures almost 6-inches in diameter! 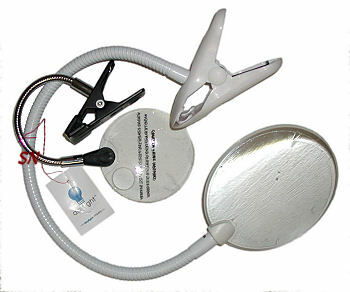 Flexible gooseneck arm can reach out to 23 inches. The only cord plugs into the base. There is no cord reaching through the stick of this! Weighs about 6 pounds, white. Very Nice! It unfolds into a really nice sized (!) 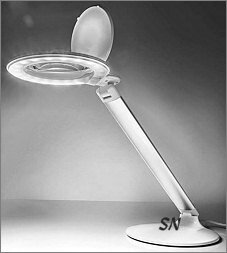 table lamp -- the 12-inch arm tilts, the lens and bulb top tilts AND rotates, and there is a protective cover over the lens. It has three daylight-balanced LED light levels -- meaning it dims -- with the touch of your finger. 6-inch low-profile base, that lens is 3-1/2 inches in diameter with a 5 diopter magnification (most of the lamps on the market are only 3.) You do need electricity to use it... no rechargeable battery system inside. It's clean, it's white, it looks nice, it's SO portable, we are very impressed! Comes in a little box -- 6 x 15 x 2 -- we can Priority Mail this baby for the 2-pound rate!!! The bigger one... this one has a 5-inch lens with an 18-inch gooseneck arm and a more heavy-duty clamp attachment. Super-duper handy... just watch your table... you might need to add a piece of fabric between the clamp and the wood -- these are pretty powerful clamps against a lovely wood table! Super portable, great for travel and classes! These are the handiest gadgets to have! 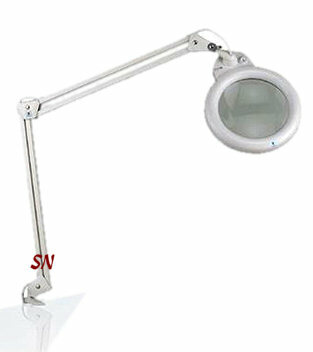 Small, lightweight, powerful magnifiers, they feature either a clamp or weighted table base. Available in the mini-size, which I think is just the coolest thing, or slightly larger, every stitch bag, and stitcher needs one! 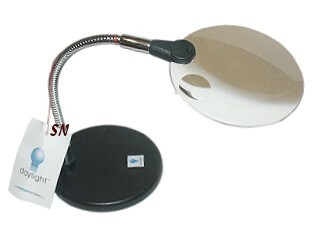 Our best-selling mini-magnifier is now available on a tiny base! Joining the clip-on version, this is the BEST little gadget to have tucked in your bag! The lens: 3-1/2" in diameter and a powerful 5-diopter, is mounted on an 8" gooseneck arm, and features a flat, weighted base. Very well balanced, it's petite, and SO handy for so many things! is the original Ott lite! A great design, it reminds me of a block of Velveeta cheese when it's closed! Simply flip up the top, and the light comes on. 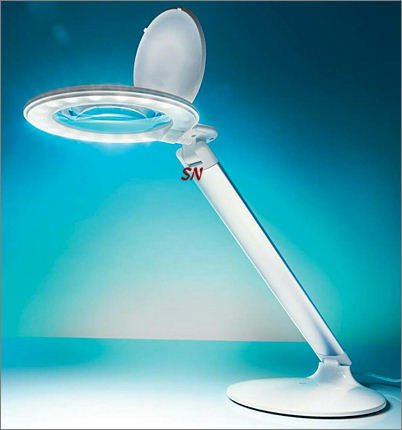 It's wonderful because the bulb is shaded from your eyes, and points the light directly onto your working area. Small, compact and perfect for travel... if you need a little magnification too, take along a Mini-clip magnifier! Best of all, it's an affordable $60.00!